There's nothing about the 26LC2R's exterior that gives away its budget heart. Its matt black fascia, offset by a rounded silver strip under the screen actually looks quite snappy. The set is also HD Ready despite its price - a fact that's reflected in its decent connectivity, which includes an HDMI, component video inputs, a D-Sub PC port and two Scarts. Perhaps inevitably, the 26LC2R doesn't have a built-in digital tuner, but in other respects, it's actually rather more feature-laden than we might have expected. Not least among the attractions is LG's XD Engine image processing system, designed to improve: image clarity; colour saturations/tone; contrast; brightness; colour gradation/ grayscaling; and frame rate handling during movie viewing. We also got some mileage from the black level adjuster and Cinema mode for improving film's motion handling as opposed to video. Considering its price, the 26LC2R's pictures aren't bad. Leading off a fair run of strengths is an imposing fine detail performance that leaves hi-def pictures looking surprisingly sharp, crisp and textured. The fact that even a 26-inch TV as low-cost as this LG can display the 'HD difference' means you don't need a huge screen to benefit from HD's extra resolution. The picture is also attractively vibrant with rich, fully saturated colours and good brightness levels. Tones are natural, particularly during HD viewing, and even the harshest colour clash is devoid of edge seepage or flaring. Motion, meanwhile, is handled with relatively little trouble from the smearing noise often caused by LCD's response time issues, and even video noise (a recurrent problem on many of LG's current flat TVs) is passably well suppressed here. The biggest problems are that skin tones occasionally look a touch ruddy, and dark areas of the picture just don't look as profoundly black as they could. Instead they're infused with a sort of blue-grey mistiness that has the knock-on effect of making dark scenes feel flat and short of background detail. We should probably also add that the XD Engine processing loses its way rather with weak sources such as a grainy analogue or blocky digital (via a Sky receiver) broadcast, slipping into smearing and even losing its grip on colour toning in extreme circumstances. But such problems with standard def aren't uncommon in the LCD world and are probably fair enough for the price. Sonically, there's no great frequency range, but loud moments are still delivered with clarity and punch and without reducing to serious harshness or distortion. 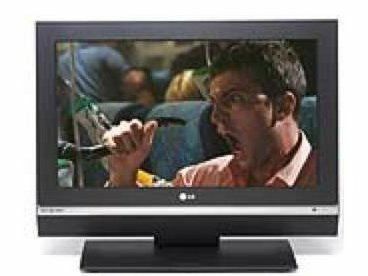 While not the finest TV in its class, it is the cheapest and it definitely punches above its rockbottom price tag.